BIXOLON Co., Ltd. the global manufacturer of advanced receipt, label and mobile printers is proud to announce it has been named the World’s leading Mobile Receipt Printer Manufacturer by the Japanese research firm Chunichisha Co., Ltd. for the fifth consecutive year. Cited in Chunichisha’s Whole Picture of the Printer Market Report, published in July of 2018, the report highlights BIXOLON’s sustained position having the highest mobile receipt printer market share globally. Since entering the market in 2007 with the SPP-R200 compact mobile printer, BIXOLON has built an impressive portfolio of high quality, compact receipt and label printing solutions, introducing the next-generation SPP-R200III, SPP-R210, SPP-R310 and SPP-R410 mobile printers. Its mobile printing solutions support cutting-edge connectivity, including embedded NFC tags enabling auto-Bluetooth pairing and a SoftAP feature for simplified Wi-Fi onboarding. Alongside out-of-the-box printing for all Microsoft® Windows®, Android™ or iOS® devices. Its latest models are Apple MFi iAP2 certified and are designed for dual-purpose receipting and multi-purpose labelling for standard or lineless label media. 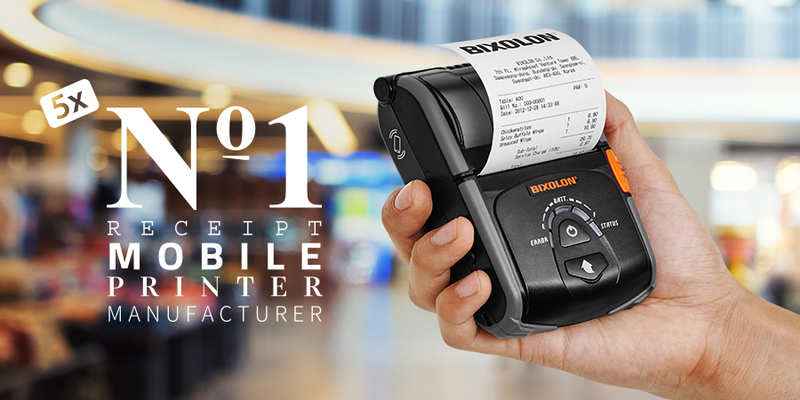 BIXOLON mobile printers are ideal for mPOS receipts, line-busting, onboard ticket sales, direct store delivery, electronic citations, meter reading and other on-the-go printing applications. 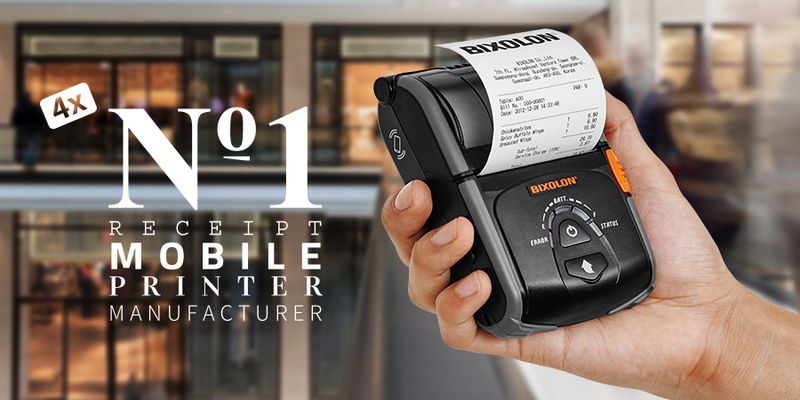 Later this year, BIXOLON will be expanding its mobile printer line-up adding a specialized mobile receipt printer for the mobile payment industry. Alongside a semi mobile label and industrial-class label printer for logistics industry. “BIXOLON’s continued success within the Mobile Printer Market can be attributed to its ongoing commitment to research and development meeting the changing requirements of the evolving marketplace,” explains John Kim, Marketing Director, BIXOLON Co. Ltd. “As mobile printing needs change, BIXOLON powers emerging technologies to fit customer’s unique environments producing industry-leading product line-ups and specialized customization. This approach has benefited BIXOLON and will fortify its global leadership position in the mobile printing market in the coming years.” About BIXOLON BIXOLON is a leading global manufacturer of innovative, advanced printing technologies including point-of-sale receipt, label, Auto ID and mobile printers for a wide range of environments. Millions of BIXOLON printers are used today in retail, hospitality, healthcare, banking, ticketing, post/parcel, warehousing and other transaction-intensive industries. In 2018, for the fifth consecutive year BIXOLON was named global mobile receipt printer market leader by Japanese research company Chunichisha. For more information visit http://www.bixolon.com or contact your local BIXOLON sales representative. BIXOLON Co., Ltd., the global manufacturer of advanced receipt, label and mobile printers is proud to announce that Japanese research firm Chunichisha Co., Ltd., has named BIXOLON the global leader in the mobile receipt printer market for the fourth consecutive year. Chunichisha’s Whole Picture of the Printer Market Report, published in July of 2017, highlights a BIXOLON receipt printer market share of 32.9% in 2016, a slight increase over the prior year, with more than 692,800 total units shipped. BIXOLON’S market share equals roughly one-third of all mobile receipt printers shipped worldwide, a volume more than twice that of its closest competitor. Since entering the market in 2007 with the SPP-R200 compact mobile printer, BIXOLON has built an impressive portfolio of high quality, compact receipt and label printing solutions, introducing the next-generation SPP-R200III, SPP-R310 and SPP-R410 mobile printers. These offerings support cutting-edge connectivity, including embedded NFC tags enabling auto-Bluetooth pairing and a SoftAP feature for simplified Wi-Fi onboarding and out-of-the-box printing from all Microsoft® Windows®, Android™ or iOS® devices. These models are Apple MFi iAP2 certified and are designed for dual-purpose receipt and label printing on receipt rolls, standard or liner-less label media, making them ideal for mPOS receipts, line-busting, onboard ticket sales, direct store delivery, electronic citations, meter reading and other on-the-go printing applications. 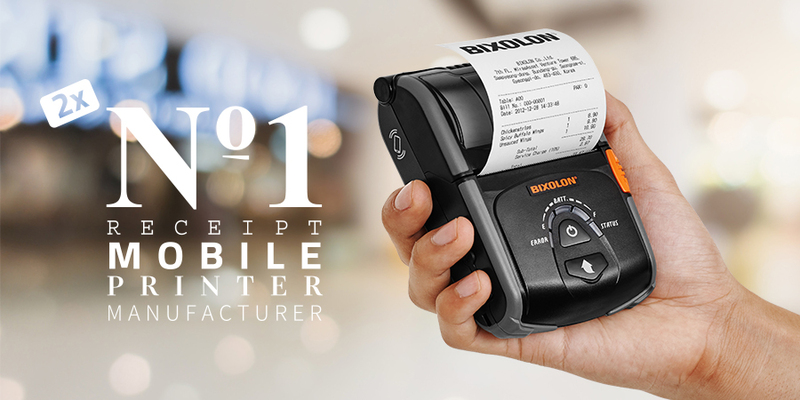 “BIXOLON’s growing share in the mobile receipt printer market reflects our extensive investment in research and development,” explains John Kim, Marketing Director, BIXOLON Co,. Ltd. “As mobile printing needs evolve with a changing workforce, BIXOLON leverages emerging technologies to simplify printer connectivity out-of-the-box—making our products very easy to use. This approach serves us well and will fortify our global leadership position in the mobile printing market in the coming years.” About BIXOLON BIXOLON is a leading global manufacturer of innovative, advanced printing technologies including point-of-sale receipt, label and mobile printers for a wide range of environments. Millions of BIXOLON printers are used today in retail, hospitality, healthcare, banking, ticketing, post/parcel, warehousing and other transaction-intensive industries. In 2017, for the fourth year in a row, BIXOLON was named global mobile receipt printer market leader by Japanese research company Chunichisha, securing a 32.9% market share. For more information, contact us at http://www.bixolon.com, or follow us on these social channels: Twitter, Facebook and YouTube. SEONGNAM, South Korea--(BUSINESS WIRE)--BIXOLON (KOSDAQ:093190) the global manufacturer of advanced Receipt, Label and Mobile Printers is proud to announce Chunichisha, the Japanese Research Company, has named BIXOLON as the Global Market Leader in the Mobile Receipt Printer market for a third year running. The 2016 report highlights BIXOLON as the ongoing Global Mobile Receipt Printer market leader, securing a 31.9% market share. Since first entering the market in 2007 with the launch of the SPP-R200 compact mobile printer, BIXOLON has built an impressive portfolio of high quality, compact receipt and label printing solutions, with the NEW SPP-R200IIIand the SPP-R310 next generation mobile printing solutions launching in 2016. BIXOLON’s new mobile printers support cutting edge connectivity technology, such as Easy Bluetooth Pairing™ via an embedded NFC tag enabling auto pairing with Android™, iOS™ & Windows® devices, alongside Apple MFi iAP2 certification. These next generation, rugged, lightweight printing solutions, complement BIXOLON’s existing range of 2”, 3” and 4” mobile printers. Designed for the dual purpose receipt and label printing with optional linerless media printing capabilities, the printers are ideal for a range of applications from warehouse invoicing to multi-platform POS ecosystems and digital payment. Providing an exceptional return on investment, BIXOLON’s mobile printers come with an industry leading two year warranty as standard, with the option for extended warranty. “BIXOLON’s ongoing success within the Mobile Receipt Printer Market can be attributed to its ongoing commitment into research and development to meet its challenging customer requirements,” explains John Kim, Marketing Director, BIXOLON Co,. Ltd. “As the mobile printing market continues to evolve, BIXOLON is continually looking for cutting edge new technology to maintain its position as a global leader within the mobile printing market.” About BIXOLON BIXOLON is a leading global manufacturer of dependable innovative and advanced printing technologies that include POS, Auto ID and Mobile receipt & label printers for a range of environments. BIXOLON views its printing technology as an essential tool for any business and holds itself to the highest standards, since dedication to customers is its core belief. BIXOLON’s FAST, FLEXIBLE and FRIENDLY approach to business has much to do with its recent success. For more information visit http://www.bixolon.com or contact your local BIXOLON sales representative. SEONGNAM, South Korea--(BUSINESS WIRE)--BIXOLON Co.,Ltd. 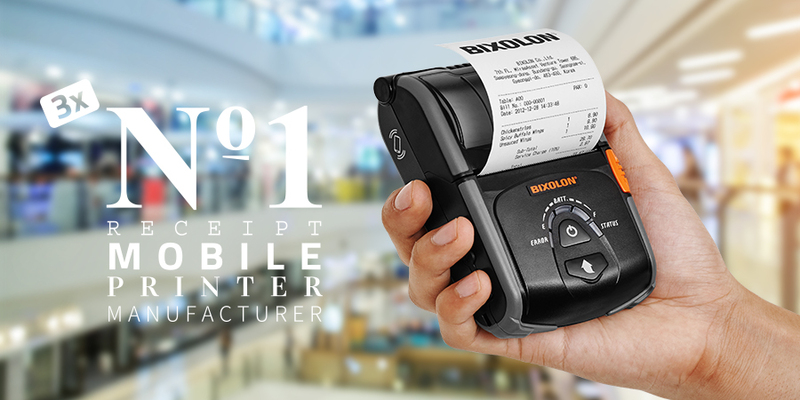 (KOSDAQ: 093190)(www.bixolon.com) is proud to announce that Chunichisha, the Japanese Research Company, has named BIXOLON as the Global Market Leader in the mobile receipt printer market in 2013 and 2014. The report highlights BIXOLON as the only brand to have grown within the global mobile receipt printer market during this time. BIXOLON first entered the mobile printer market in 2007 with the launch of the SPP-R200, thereafter developing an extensive portfolio renowned for its high quality and compact designs whilst being both lightweight and rugged. Available in 2”, 3” and 4” printing formats, all BIXOLON mobile printers come with an industry leading two year warranty as standard, with the option for extended warranty. Simple service and repair, BIXOLON mobiles offer an exceptional return on investment. Designed for the dual purpose of receipt and label printing, BIXOLON mobiles provide linerless media as an additional option. BIXOLON’s mobile printers are ideal for virtually every application from warehousing and logistics, to mobile payment and trend sensitive retail applications. BIXOLON mobile printer connectivity includes Serial, USB, Bluetooth and WiFi while supporting all major operating systems including Android™, iOS™ and Windows™. Boasting Apple MFi certification, all BIXOLON mobile printers can easily connect with iPad®, iPhone® and iPod Touch® devices. BIXOLON also offers an extensive range of high quality mPOS solutions, including Bluetooth and WiFi desktop printers and hub solutions which connect Tablet PCs or Smartphones to POS peripherals to provide a complete mPOS solution. Mr Nick Lim, Director at BIXOLON explains, “BIXOLON believes in being proactive, responding to the ever changing requirements of the mPOS market. By continually developing and improving its extensive portfolio of mPOS products, BIXOLON can meet the challenging requirements of all its customers.” About BIXOLON Co.,Ltd. BIXOLON is a leading global manufacturer of dependable and innovative and advanced printing technologies that include POS, Auto ID and Mobile receipt and label printers for the Retail, Hospitality, Healthcare, Warehousing and Logistics markets. BIXOLON views its printing technology as an essential tool for any business and hold itself to the highest standards since dedication to customers is its core belief. BIXOLON’s FAST, FLEXIBLE and FRIENDLY approach to business has much to do with its recent success. For more information visit http://www.bixolon.com or contact your local BIXOLON sales representative.